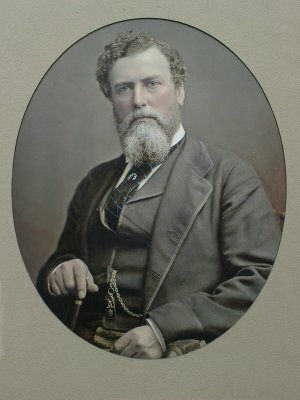 Description Large framed photograph of Dr Thomas Renwick. The photograph is mounted in an oval mat with an oak frame. It is hand coloured. The is a small plaque on the bottom of the frame "Rgt Hon. Dr. T. Renwick, founder of Renwicktown." This text is repeated on a white plastic label screwed to the top of the frame.